New Ear Warmers, Knitting Patterns, a Sale and a Giveway! Back in the fall I declared this winter the season for wearing cuter headbands. Banish the big flowers made by grandma! Be gone, sorority-esque cliches! Now, with much trumpeting and fanfare, I pull back the red curtain and unveil to you two new lines of cute chunky knit headbands. Plus, get your scroll on: 20% off all new headbands and enter to win one for Christmas! Some one-of-a-kind pieces came out of the design process too. Here are a few of my favorites. Find more in the shop under the Eco Accessories tab. OK, smarty pants, so you know how to knit, huh? Great, you can make these for all your friends! The knitting pattern for the braided cable knit ear warmer is free at transientexpression.com. Note that if you use super bulky yarn like I did, you only need 8 repeats of the pattern. The knitting pattern for the convertible turban headband and cowl is $3 on Ravelry or at knitsforlife.etsy.com. From now until Christmas, save 20% on my new ear warmer headbands in the Etsy shop with code XMAS2012. I ship items the same or next day in cute, hand-stamped gift wrap with no price on it so you can gift it directly in the mailing package. I also include a free vetiver-scented buckwheat sachet your recipient can pop in the microwave and use as a pocket hand warmer. They’ll be warm cuddly from head to toe! 3. Leave a comment below letting me know you’re in! Don’t forget to order by December 17 in time to ship for Christmas. Teresa at Outdoor Alphabet: Help! We need a gigantic acorn and some little ones to match our new logo. Lorna at Knits for Life: I’ll design it on the double! Dozens of hours and a lot of OCD later, this not-so-little acorn is prompting predictions of 8-foot squirrels on Twitter. At first stuff: 18 inch acorn ready to be sewn up and shoved into shape. @KnitsforLife for a very BIG Squirrel?? The little ones sent me on a hunt for the perfect acorn shape. Six acorns later, the fruits of these labors deserve to be shared as a free crochet pattern. I’ve also been wanting to design a cut-out pattern that’s easy to read. Opportunity knocks! Did I mention it’s a free pattern? Do you lose your place as much as I do when you knit or crochet? It’s the pits! 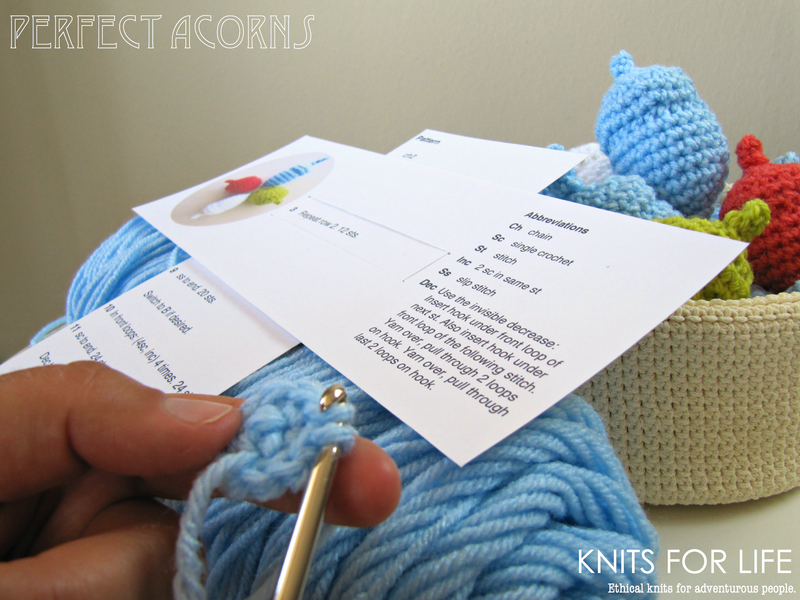 This cute idea shows one line of instructions at a time, with the finished item and the abbreviations right there. No more picking up and dropping my pencil, no more flipping through pdf pages on my e-reader. It’s wonderful! I hope you’ll find it useful. I’d love to hear what you think in the comments. Day of the Dead is a colorful holiday in Mexico on the day after Halloween. Families celebrate the dead with bright yellow marigolds, wildly ornamented sugar skulls, and banners of finely perforated paper (papel picado). In the spirit of “death is the thing we all have in common,” jaunty skeletons in sombreros, traditional dresses, and pedaling away on bicycles fill every corner of these decorations. I wanted to fill my home with the bright colors and passion of Mexico on a skull banner that would last. So, I designed four fun skull images in an easy, charming project any beginner can do. There are no charts, just simple repeated motifs–clearly explained. If you like charts, you’re bound to quickly get the hang of the motifs and can use the high-quality images as a chart. I recommend using cotton crochet thread, but the designs come out great even with sport or DK weight yarn. This set includes all four designs–what a deal! Download it now wherever you shop: Craftsy, Ravelry, or Etsy. My aunt walked in to my grandma’s house carrying her laptop in a home made crochet bag and I did a double take. We crocheters always do double takes at crochet and knitting, but this was because I thought I saw her carrying a sleeve with a handle. Duh! Everyone makes laptop sleeves, but then you have to carry it like a book. When what you really want to do is carry it like a bag. Turns out it was all a vision. My aunt was carrying a laptop sleeve by its flap as if it were a handle. I was in good company getting an idea this way. Isaac Mizrahi stops cabs to follow people on the street. Or rather, to follow their clothing. Introducing my latest design, a laptop sleeve with a handle and in a fashionable crochet lace pattern. Buy it in fun colors or buy the pattern to make your own at knitsforlife.etsy.com. In a dark little café pub near the Black Forest in Germany, I came to love hot drinks served in ceramic white pint glasses. Reliving those gemütliche college days every time I sip tea, Earl Grey, hot is easy with IKEA’s lovely and affordable POKAL tumblers. Slurping the first sip of a hot drink is one of life’s little pleasures, but hard to do without a mug handle. After perfecting a custom cozy, I wanted to make one for my sweetheart for Valentine’s Day that wouldn’t embarrass him at work. A touch of geekery and voilà: I love you in Morse code. What do you sip your tea in? By popular demand, this crochet pattern includes the instructions for a the beanie with a panel for a nice timey wimey button AND for the hat with attached scarf and secret buttoned pocket. I had tons of fun designing this ultimate warm winter accessory for the Doctor Who fan that is modern enough for any wearer. The lights are on inside the time machine with two stripes of creamy white. Tweedy navy blue yarn is crocheted in a raised stitch pattern to mimic a wood paneled police box all the way down the scarf to the secret pocket. The timey-wimey buttoned pocket stores your soul alongside headphones, phone, mp3 player or keys. This hat and scarf combo will really get your eco-geek on! The directions for making this textured crochet pattern are easy to understand and do. I aim to design crochet patterns any knitter would envy. Two patterns in one, with directions for each in all four sizes. Each size requires just one size hook and is worked from the top-down in one piece with no joins. Includes color changes, front and back post stitches, and an adjustable loop. I’d love to see your finished products and customer action shots on the pattern’s Ravelry page or on Knits for Life’s Facebook wall! The finished items are also for sale in the shop.